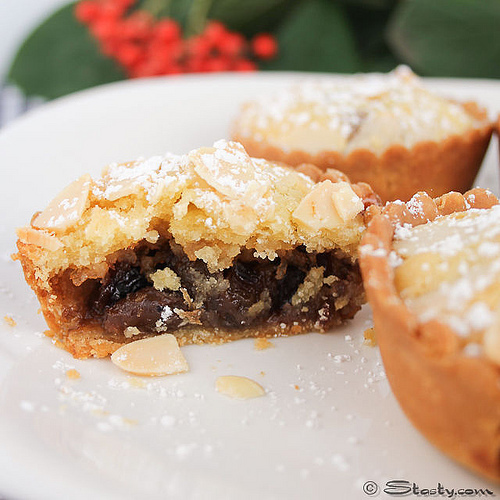 Foodista | Frangipane Mince Pies You Must Try! Having just moved to America from Ireland, I’m learning new things every day. Ground almonds are called almond meal, chick peas are called garbanzo beans, and some Americans look horrified when I offer them a mince pie! I now realise mince pies are just not that popular over this side of the pond. Just to clarify – not all mince pies contain meat. Mincemeat is actually just a sweet jam of dried fruits, alcohol, and spices. My sister has lived here a while, and she thinks mince pies aren’t popular because Americans don’t like dried fruit. Whatever the reason may be, I would love to convince even one person here that mince pies are absolutely delicious and really should not be missed. In fact, these mince pies are good enough to tempt even the most ardent mince pie hater. 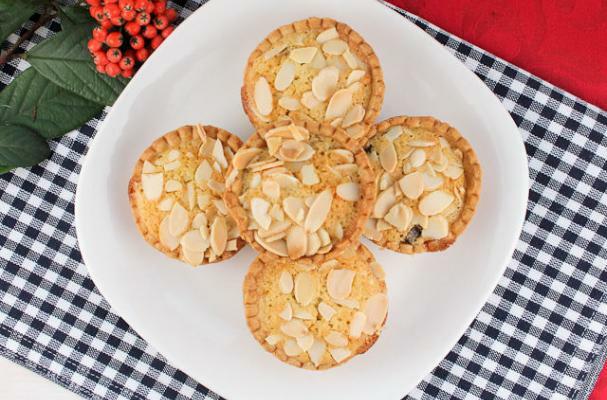 Frangipane mince pies are full of buttery nuttiness and toasted almonds. The heady mix of fruit and alcohol (aka the mincemeat) at the bottom, fluffy almond frangipane, and crisp pastry make these the ultimate Christmas indulgence. They taste great with a cup of tea or coffee, and are even strangely delicious with a neat Irish whiskey. So, I really think you should give these mince pies a try. To make the pastry, sieve the flour into a large bowl. Cut the butter into cubes and add it to the flour along with the salt. Rub the butter into the flour until it resembles bread crumbs. Next, add the water a little at a time. Bring the pastry together with a fork, until it forms into dough. Take the pastry dough and wrap it in cling wrap. Place it in the fridge and leave it to rest there for at least thirty minutes. Pre heat the oven to 350 degrees Fahrenheit. Meanwhile, to make the frangipane, place the butter and the sugar in a food processor. Blitz until it forms a smooth paste. Next, add the eggs and blitz until combined. Finally, add the ground almonds, almond extract, and flour. Pulse until it comes together. Once the pastry has rested, take it from the fridge and remove the cling wrap. Dust a clean surface with a sprinkling of flour. Roll the pastry out on the floured surface until it is about an eighth of an inch thick. Cut the pastry into rounds with a fluted pastry cutter. Place the pastry rounds into a two (12 hole), non-stick muffin tins. Place a teaspoon of mincemeat into each pastry cup. Next spoon a teaspoon of frangipane mixture on top of the mincemeat. Spread the frangipane evenly on top with the back of a spoon. Scatter some flaked almonds on top of the frangipane. Place in the oven for about 20 minutes – or until golden brown. Once cooked, leave to cool in the tin for ten minutes. As soon as the mince pies are cool, gently remove them from the tin and place them on a wire rack. Serve with some cream/ice-cream on the side. These go especially well with vanilla ice-cream. http://stasty.com/Stasty is a simple and tasty food recipe blog. I love to cook and I love to talk about food, so this blog is really my ramblings and thoughts about cooking and eating. Some of the recipes are my own and some are ones that I found on the net or picked up from my favourite cookbooks. I cook everything in our compact apartment kitchen overlooking the park. I am aided and abetted by my I.T guru/tantrum-trouble-shooter/editor and chief-taster otherwise known as the OH (Nelius Phelan). Sometimes I’ll have posts about my favourite foodie finds which are products that I have just discovered and can’t wait to shout about. There will also be a few posts on gadgets which I can’t live without out and a few quirky ones too that I must have. There will also be the odd restaurant review and a few animal antics from the Stasty homestead along the way. Visit me on Facebook or follow me on Twitter.